I have now had two very relaxing massages and 2 Reiki sessions with Sanchia, both of which left me feeling totally refreshed. Sanchia has a very well equipped massage room, nicely done with calming music to set the tone. I would highly recommend Sanchia to my friends and will visit again soon. Had the most amazing massage by Sanchia not so long ago for my birthday. My word, after telling her I have tightness in the muscles around my jaw, she really focused on those and also the muscles in my shoulder and neck - it made me feel so much better! Couldn’t recommend anyone else! This is a 4000-year-old Indian head, face, neck, shoulder, arm and hand massage. Highly relaxing, this massage reducing tension around the neck. It also includes face reflexology techniques, pressure points work and a face massage using natural essential oils. This deeply relaxing session will leave you with a strong sense of inner calm, peace, rebalance, self-healing and overall wellbeing, whilst also leaving your face skin boosted, detoxified and renewed. It can be tailored to your needs, and hair oil can be added. This is an ancient therapy that balances your energy, brings a sense of deep inner calm and encourages the body to self heal. During this session you remain clothed, taking time to switch off your mind, relax your body and connect to your soul for deep relaxation and rebalancing of your energy centres (chakras). The Scientific Bit: Scientists agree that we are full of energy and surrounded by energy everywhere. In schools they show children how to light a bulb using only human energy. That's because every 60 billion cell in the body has an organelle called a mitochondria and its job is to create energy for every cell. That is a lot of energy in the body alone! Ear candling is a very safe, deeply relaxing and an effective therapy. I am a fully qualified ear candling practitioner. It was used for centuries by ancient Greeks and Native Americans who believed it to have holistic and energetic benefits. The candles are actually hollow tubes made using organic cotton, pure beeswax and traditional herbs (sage, St John's Wort and camomile). Ear Candling works with a safe gentle suction being created in the ear that results in health benefits and wellbeing. This session includes a calming face and head massage. Sinus and tension headache techniques can be included. The health benefits can include reducing and softened ear wax, sinus pressure release, equalized ear pressure, reduced stress/anxiety, clearer thinking, improved lymphatic fluid flow, improves snoring, reduces tinnitus, decreased pressure headaches and a sense of inner calm. You cannot have this therapy following recent ear surgery, if you have/had an ear infection/inflammation, if you have an infectious illness (i.e. flu, virus etc), inserted grommets, cochlear implants or perforated ear drums. Do check with your GP if unsure. This is a perfect well-being blend of a 30-minute full relaxation and tension release massage, followed by 30 minutes of relaxing energy re-balancing. A mind, body and soul session that supports full relaxation, promotes self-healing, and brings your mind, body and soul back into balance. Crystals can also be used. This is the perfect combination of ancient and modern therapies. Facial reflexology is an ancient treatment used to support full wellbeing - working gently on acupressure reflex points on the face. 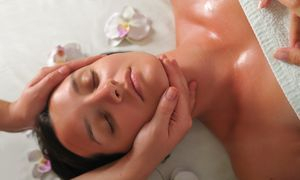 This session also includes face massage, using precise massage techniques to invigorate the skin using natural essential oils. This encourages fresh circulation to the skin and reduces puffy eyes, which promotes skin cell renewal along with lymphatic skin detoxifying...leaving you relaxed and your skin renewed, toned and refreshed. This is a tension-releasing bodywork massage that uses effective techniques around the upper body, neck, shoulders, face (jaw/sinus) and head. This benefits tension headaches, sinus pressure or general neck discomfort, whilst using refreshing essenial oils. Please always check usual, ongoing or regular headaches and migraines with your GP. Myofascia release: The connective tissue that covers the whole body and contributes to tightness. Trigger point release: A trigger point is a 'knot' of tightness in the muscle fibres that can cause transferred discomfort, tingling or numbness either in that immediate area or elsewhere. For example, tension headaches caused by tension in the neck or jaw. Muscle energy techniques: designed to work at the source of the muscle tension with warming, isolated, slow and deeper muscle release using hands, forearms and elbows. Effective stretches: Guided stretches that encourage muscles to gently lengthen and release tension. Lymphatic Massage: This is a gentle touch massage that uses slow rhythmic strokes all over the body to circulate the lymphatic fluid that is present all over the body. The Lymphatic system's job is to cleanse and filter out toxins from the body's circulatory system and plays a crucial role in the body`s ability to heal as it transports nutrients and disease-fighting white blood cells. The Scientific Bit: How do Crystals work? Reiki is totally safe in pregnancy (recommended after 3 months), for children, ill and elderly. Cannot be used if you have a pacemaker. For special offers, updates and new treatments click on this Facebook icon and 'like' or 'share'.